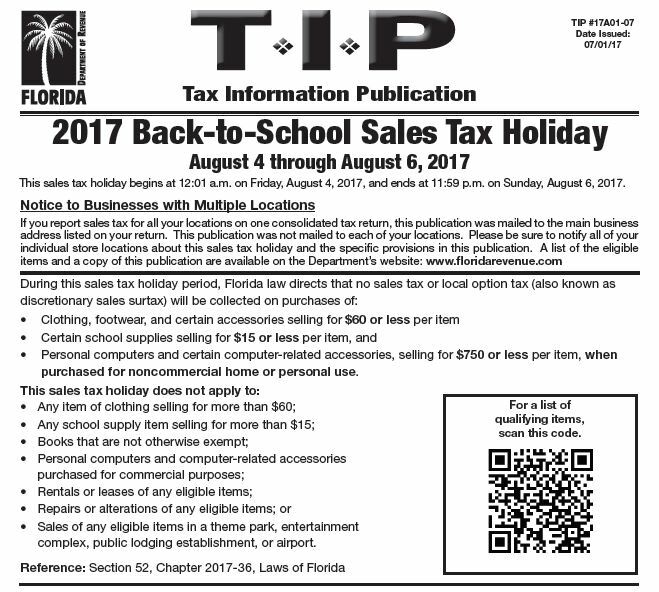 Home/News Articles, Sales and Use Tax, State Taxes/Florida Sales Tax Holiday August 4 – 6th! The 2017 Back-to-School Sales Tax Holiday was passed by the Florida Legislature and signed into law by Governor Rick Scott. This sales tax holiday begins at 12:01 a.m. on Friday, August 4, 2017, and ends at 11:59 p.m. on Sunday, August 6, 2017. During this sales tax holiday period, qualifying items will be exempt from tax including: certain school supplies selling for $15 or less per item; clothing, footwear, and certain accessories selling for $60 or less per item; and personal computers and certain computer-related accessories purchased for noncommercial home or personal use selling for $750 or less per item. For more information and a list of qualifying items, please review the Department of Revenue’s Tax Information Publication (TIP) on the 2017 Back-to-School Sales Tax Holiday, as well as the Frequently Asked Questions document. For your convenience, the digital downloads and social media posts below are provided for individuals and businesses interested in sharing information about the sales tax holiday.